There is no such thing as a parenting manual. There are a slew of books that teach you how to get your baby to sleep all of which are a variation of each other, BTW. There are many books about how to make your toddler happy and how to get your kids to listen to you. The choices are endless. But, there is no one size fits all guide book for how to be a parent. Truthfully, there shouldn't be. Every family is different. Every kid is different. I've only been doing this parenting gig for four years. 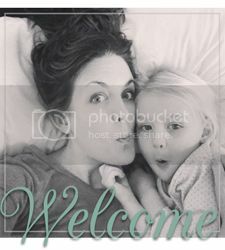 But, I do feel that there is one rule as a parent to be, current parent, or even as a person who sees children in your distant future that you must adhere to. That is, of course, unless you like to feel foolish. Parenting in and of itself already provides a great deal of humbling. Why add fuel to the fire? And while we're at it with the cliches, better safe than sorry right? Just forever assume that anything can happen outside of the realm of what you think you might do, and you'll be good to go. This is my very best parenting advice. No really. It is. It's very simple. NEVER SAY NEVER. I love it when people without kids say something like, "my kids will never use an Ipad or Iphone while we are at a restaurant". Or, "I will never talk in detail about my kids poop". To you I say, maybe not. Maybe you won't. But you probably will so let's not put an absolute on things until we know for sure K? Because never is pretty final. I also clearly remember a time when I would look at other people's kids who were losing their mind in a public place while my sweet six month old Lila was happy as a clam on my hip. I would look and think to myself, "my beautiful angel will never act that way". Please pay very close attention to this part. The minute you even think, let alone SAY OUT LOUD, a never phrase about how your children will behave you are completely screwed. Because now the universe knows you thought it. Or, now your friend with the out of control kid heard you say it. And now, without a doubt, it will happen. There is no wiggle room here. I have experienced it firsthand and I've seen others experience it. You may not get the exact same behavior, but it will be similar. And you will remember what a smarty pants you were for saying never. You will remember this while kicking yourself because you pretty much asked for it to happen by saying never. Other examples may include but are not limited to, "I will never raise my voice with my kids" or "my children will never hit/bite/push other children". Be very careful my friends. Eating your words is never fun. Parenting involves a lot of good, a lot of crazy, a lot of bad, and a never ending learning curve of trying to figure out what works best for your family. If you just remember to never say never you have cut out the possibility of sounding like and feeling like a know-it-all jerk. Just sayin'. DISCLAIMER - I am positive that I said never phrases a lot to myself and out loud in the early days of being a mommy and prior to having a child. Now, I can't even remember the last time I said one. This does not make me a better parent. It only makes me feel a little smarter for not holding myself to some unnecessary expectation when I didn't have to. Every little thing you can do to make parenting seem easier is a plus! 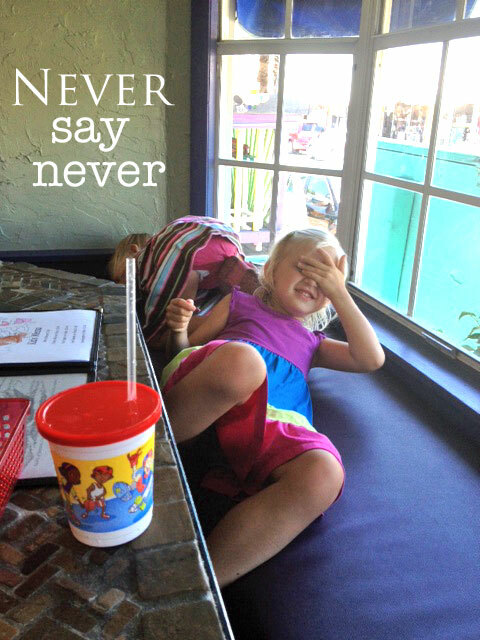 There was a day when I said, "my children will never get rowdy in a restaurant". Please see the picture at the beginning of this post. We were at the beach, no one else was in the establishment, and we were all a little done with "vacation". These things happen.